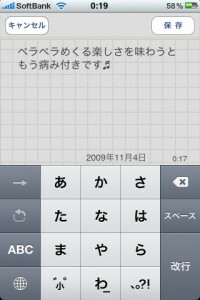 It is easy to use one hand still because of a simple composition though it is a note pad application program. In addition, it changes into the table view if Sheik is done while inspecting it and the latest memo comes always to come to the head. And, if the left and the slide are done from the right and the right from the left, the lower side of the screen meets the sense to turn over the page of the book with the thumb. Sending and the return of the page are possible according to operation to page by the thumb. 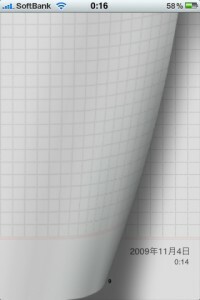 It changes into the table view if it shakes it. 2.The list display is possible according to the double tap of the part to which the number of pages is displayed. 3.Page sending by the thumb and the reaction scope of the return are expanded. 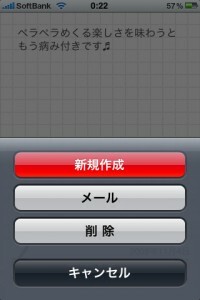 *The reaction of the menu icon was made to correspond to the double tap and “Operation of sending/return” became easy. *The matter to which the same memo was displayed was canceled.